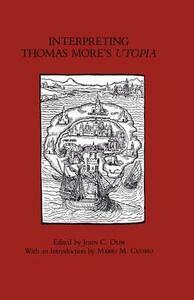 The proceedings of a symposium commemorating the 450th anniversary of Thomas More's death and the 50th anniversary of his canonization, Interpreting Thomas More's Utopia presents four leading Morean scholars on various aspects central to understanding More's masterpiece. An introduction by Governor Mario M. Cuomo in which he assesses More's influence on his career in public life precedes this stimulating discussion. The contributions, in order of appearance, are "A Personal Appreciation" by Mario M. Cuomo, "The Argument of Utopia" by George M. Logan, "The Key to Nowhere: Pride and Utopia" by Thomas I. White, "Utopia and Martyrdom" by Germain Marc'hadour, and "The Idea of Utopia from Hesiod to John Paul II" by John C. Olin.